Barely managing to scrape a living gathering wood from the side of a busy road in TamilNadu, Ranji accepts his lot uncomplainingly. His one and only concern is to feed his beloved family and keep them safe in their hut beneath the banyantree. But when a huge new tyre falls from a passing truck, Ranji realises that this could change his life forever, and embarks on a quest to turn his good fortune into cold hard cash. But his growing obsession causes Ranji to neglect his beautiful wife Meena, who is struggling to resist the advances of the wealthy local brick-maker. And as Ranji’s formerly simple life fills with worries and conflict, he starts to question whether the tyre is in fact a curse rather than a blessing. 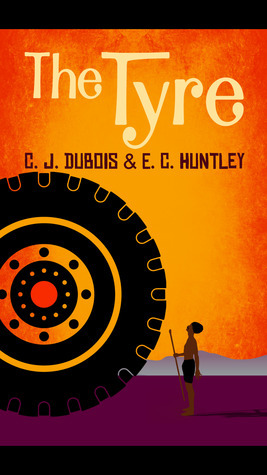 The Tyre (translated from the original French) is a compelling read. I was captivated with Ranji's story from page one, and it was fascinating to see the ups and downs he and his family faced, all from the discovery of a tyre on the wayside. The book offers an interesting look at what is important for happiness, and how sometimes things that seem like blessings can have far-reaching consequences. All the characters are well drawn, and the pacing is excellent. I read the book over two nights, but it was a struggle to make myself put it down and go to sleep at the halfway mark. This is a story that will appeal to readers of literary fiction who are looking for a book that is a quick, easy read but which also offers plenty of food for thought.